Suppose that we have a pendulum freely suspended to a pivot. Above the pendulum is fixed a receptacle where there is water. A small pipe descends all along the pendulum, and at the lower end of the pendulum the pipe opens with a valve which has a peculiar way of functioning. The opening of the valve points towards the left and is larger when the pendulum moves towards the right than when it moves towards the left. Concretely one may, for example, assume that the valve is influenced by the air resistance or by some other factor that determines the opening of the valve as a function of the velocity of the pendulum. Finally we assume that the water in the receptacle is fed from a constantly running stream which is given as a function of time. The stream may, for instance, be a constant. The following illustration shows the pendulum, which is drawn as a pipe. Water runs from the Schumpeterian reservoir of ideas down this pipe. (The stream feeding the reservoir has been omitted.) In the upper left corner, the water force emptying from the pipe through a valve pushes the pendulum to the right. This continues until gravity stops the motion to the right (shown in the upper middle) – the pendulum falls back to the center. The force of gravity is stronger than the force of the water, which exits the pipe more slowly now (top right). In the lower left diagram, the pendulum passes the equilibrium position from right to left, until gravity again stops its movement (lower middle). As the pendulum starts swinging to the right again, the water flow increases back to its former strength and pushes the pendulum vehemently to the right (lower right). The meaning of the various features of this instrument as an illustration of economic life is obvious. 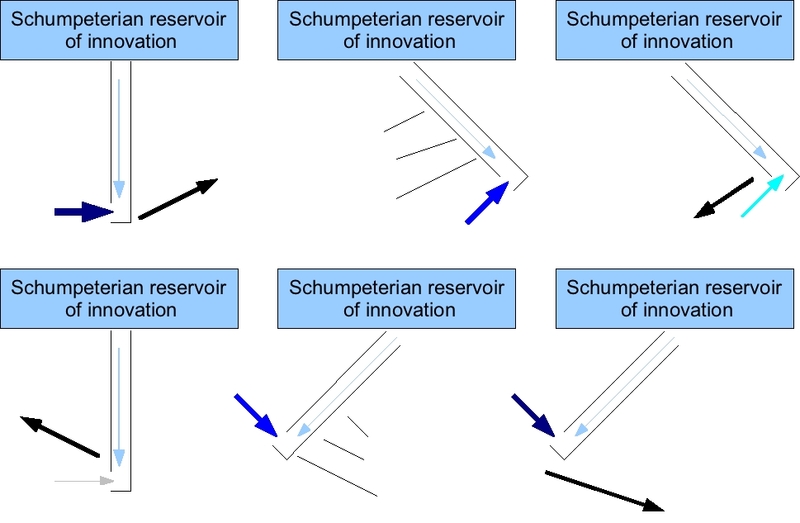 The water accumulating in the receptacle above the pendulum are the Schumpeterian innovations. To begin with they are kept a certain time without being utilized. Some of them will perhaps never be utilized, which is illustrated by the fact that some of the atoms in the receptacle will rest there indefinitely. But some others will descend down the pipe, which illustrates that these new ideas are utilized in economic life. This utilization constitutes the new energy which maintains the oscillations. Paul Samuelson (1939) built a later model that is more explicit in both mathematical and economic terms. You can download it as a Maple sheet on this page of my blog. « Pirates! Get the ballot boxes out!